What can I say that hasn’t already been said? “Dario Argento’s” Giallo film might just be the greatest one or as I might think it might just be the Greatest Movie Ever Made… I am not the only one who says this, This is the Favourite movie of two very famous Japanese Directors here “Hayao Miyazaki” and the one and only “Akira Kurosawa”. 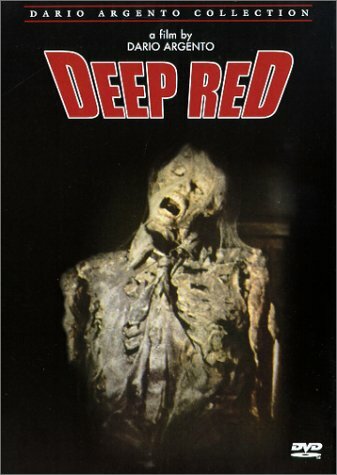 Deep Red is a tie to be my favourite film of all time with Battle Royale competing with it… But I personally think this is winning. A very famous Italian Psychic “Helga Ulmann” is making a speech on the paranormal and she is frightened when she detects a Murder among them in the audience…Frightened she ends the conference and returns home. Outside her apartment building in the ally music teacher “Marcus Daly” is having a drink with his friend “Carlo” at the bar and “Marcus” being tired returns home only to witness the Murder of “Helga” by a hatchet wilding figure that implies her throw the glass. Shocked and confused “Marcus” runs up to help her to find only her lifeless dead corpse and a figure in a raincoat just leaving the building and down the street. With the police involved “Marcus” is giving a statement but for some reason he remembers a painting in her hallway that is missing from “Helga’s” home. With the police getting no-where “Marcus” Decides to get too the bottom of things himself and with a reporter he meet at a bar. I won’t deny when I say it has some of the best characters I have ever seen our two leads are incredible. “Marcus Daly” and “Gianna Brezzi” our two lead characters have some of the most incredible dialogue and direction. We watched this 6 times at school to analyse the film (Also where I saw it for the first time). You will be surprised how much you get out of it when you keep watching and discovering new things. -Acting… Its dubbing in some versions might ruin the film depending on what country you live in, it has been dubbed into, Japanese, French, Croatian, Chinese, Mexican, and English. And the list goes on and on… Though you’re really better of watching it in English or Italian because a few leads are American. Though overall “Dario Argento’s” direction is nothing short of flawless when it comes to this stuff. 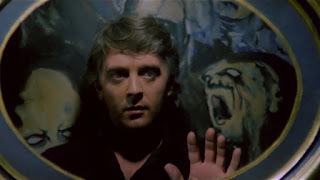 “David Hemmings” as “Marcus Daly” was brilliant and I can always say the same for the rest. Also the scene that is the most unforgetable is when "David" finds the body in the wall...Its more the fear on his face when he finds it sitting there and Goblins score in the background. -Production… Oh what can you expect from a film by “Argento”? Insane camera, very colourful lighting, Shadow effects that just blow you away, and of course very gory murder scene. Deep Red has all that thank god but I was more concentrating on the story than anything else. The music is extremely suspenseful and one of the things that makes the movie. The camera angles truly and do catch everything brought onto the screen and throw “Argento’s” head the master who thought of and created this. I can’t say the murders were that gruesome but that bath scene with the girl getting dunked under the boiling water was pretty creepy. -Final… It might overtake Battle Royale I’m still not sure yet but if you could you should see it and you will likely not be disappointed by what is the greatest mystery film of all time. If anyone does want to see it, my advice is analyse the film while viewing it. Wow, I've never seen a Giallo film before, but I just might have to watch this one now! I just hope David Hemmings is better than in Blow Up, I hated that film. Anyway, awesome review Jesse, you've convinced me! Many thanks Jack, I hope you do end up seeing it. Its the Giallo film that starts getting you into these kinds of films from the genre. And i havn't seen that yet but i might just see it for him. And Thanks again if you see it tell me what you thought of it!